For those with proper preparation (see our release forms) but having no reservation, both lower caving and upper caving are offered at 10:00 am and 2:00 pm, every day, seven days a week. See our homepage for our opening and closing dates this season. Before coming for either trip, carefully read the release form of the spelunking trip you want (upper or lower). Be prepared (especially with two sources of light, long pants, a long-sleeved shirt, and shoes with good tread and ankle support), and be sure to allow enough travel time. For reasons of safety we cannot catch-you-up with a caving trip already departed. Flashlights are available in our gift shop at reasonable prices. For schools, churches, scout groups, summer camps, and so forth wanting a private guide and group rates, reservations must be made 10 days prior to visit (phone 724-438-3003). 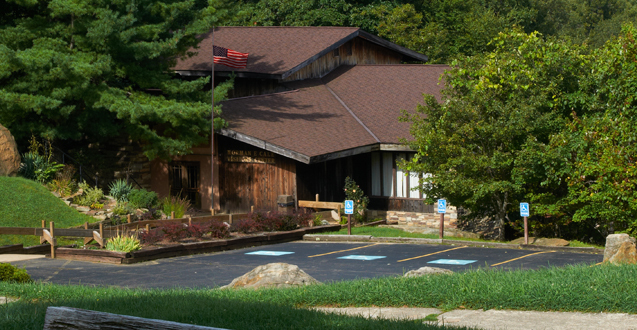 Laurel Caverns is closed during bat hibernation season to protect the bats. The bats depart around the middle of April. Caving is the more contemporary term for what is popularly called spelunking. It refers to going into a cave completely in its natural state. Due to its conservation mission, Laurel Caverns is the only developed cave in the world having its largest rooms and passages completely in their original state. Because the elevation difference from the upper passages of Laurel Caverns to its lower passages is about 45 stories (450 feet) two caving activities (i.e. spelunking) have been created. For the most part, these two trips cover different parts of the cave, though both have in common the main passages of the traditional tour as well as the ballroom and the bat room. Both trips require participants to bring at least two good sources of light. Also, each must wear long pants, a long sleeved shirt, and shoes with good tread and ankle support. Laurel Caverns will supply the hard hats. Each participant must also fill out and sign a release form. Links to the forms can be found below. The cave temperature is 52 degrees. Bring a change of clothing; this is a real caving trip and participants will get the wet sands of the cave on their clothing. Proper caving shoes are not reusable to an outfitter. Coveralls would have to be laundered after each use and the sand in them makes that very expensive. Lights could be rented but when that was tried they usually disappeared, so now they can only be sold. Thus, if Laurel Caverns outfits you for lower caving, the cost is $85 per person. If you outfit yourself, the cost is $30 per person for lower caving and $25 per person for upper caving. (Group rates deduct $5 from these rates. Remember that two sources of light are required. A headlamp and a handheld light are best. Cellphone lights, keychain lights, and other such dim sources are not acceptable. Please forgive us for the strict enforcement of these policies. We are regulated by the Bureau of Deep Mine Safety even though we are a natural cave. We are, by law, required to follow their protocols, especially with respect to rescues. Twisted ankles have to be treated as broken until X-rayed. Caving is a high adventure activity and can be dangerous. The terrain is rough and uneven. It is not a stroll through a shopping mall. Please don’t prepare for our lower caving trip as if it is. Upper caving is safer because it does not include the cliff structures found deeper down the inside of the mountain. Note: both the upper and lower spelunking tours are staff assisted, which means that a staff member will accompany groups through the spelunking tour. There are no self-guided tours at Laurel Caverns. For Upper Caving allow two hours. For Lower Caving allow up to 30 minutes for orientation and up to three hours as your “in the cave time.” Exit time can be adjusted for groups needing an early departure. Because these two activities are offered as open registration activities, anyone within the allowed age restrictions may come without advance arrangements. If your group size is larger than six people it is important to let us know when you are coming so that we may better serve you. If your group is larger than 15 people you may request a private staffer with a two week advance notice and prepayment. Please phone us at 724-438-3003. Both trips also require a signed release form which, for anyone under 18 years of age, must also be signed by a parent or legal guardian. These forms must be read carefully for they will tell you three things. First, they convey a sense of the risks associated with high adventure caving. Second, they will help you decide which caving alternative is best for your group. Finally, they tell participants how to properly prepare for their trip. Any individual under the age of 18 arriving without a parentally signed release form or not properly prepared will not be admitted to a caving activity. Trip sponsors and leaders may not sign for anyone as a proxy for the parent. PLEASE NOTE: No individual(s) under the age of 18 may participate in either the Upper Caving Activity or the Lower Caving Activity unless an adult having supervisory authority for the individual(s) is on the entire trip through the cave with them. Upper Caving begins at the cave entrance in the Visitors’ Center and combines the one hour tour with a second hour in the upper portions of the large rooms of the undeveloped cave. Participants must be at least 9 years of age. Because it is less rigorous than Lower Caving, even many adults prefer it to Lower Caving. It is suggested that children under nine years of age take the Traditional Guided Tour and strongly suggested that the physically challenged carefully consider the strenuous nature of a caving trip. On this exploring adventure there is much climbing up and over rocks. Injuries can occur from this kind of climbing and participants must respect the points made by the release form. Allow two hours for this activity. See Educational Fieldtrips for more on a group visit. Lower Caving also begins at the cave entrance in the Visitors’ Center but takes you almost to the bottom of the mountain, 45 stories down from that entrance. Participants must be at least 12 years of age. The trip permits the visitor to see over two miles of cave covering both the undeveloped cave and the lighted portion. The trip takes about three hours. Most of the passages are between ten and forty feet high. It is suggested that children under twelve years of age take the Traditional Guided Tour or the Upper Caving Tour and strongly suggested that the physically challenged carefully consider the strenuous nature of a three hour caving trip 45 stories down in elevation. On this exploring adventure there is much climbing up and over rocks. Injuries can occur from this kind of climbing and participants must respect the points made by the release form.